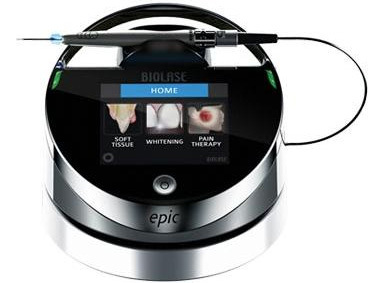 In addition to the WaterLase laser, we utilize a warm laser from BioLase for several different dental procedures. By leveraging these new dental technologies, we can achieve better results in less time, with less pain! Typically, an in-office teeth whitening session takes one hour. However, by using our BioLase laser, we can achieve the same results in just twenty minutes! That means less time in the chair, while still achieving the standard 4-6 shade difference. As a component of our treatment for TMJ and other issues of the masticatory system, including clenching, grinding and jaw/muscle pain, we use a BioLase warm laser for pain therapy. Using the laser, we are able to precisely deliver treatment to the deep muscle tissue of the jaw.